We manufacture a large range of shapes, both laser cut and routed. The materials we cut in as standard are acrylic (also known as Perspex), mirror acrylic, 3mm and 6mm poplar plywood, foam (also known as Neoprene, craft foam or Funky Foam), and MDF in various thicknesses. It is also possible to laser cut solid card, paper and fabric, so do get I touch if you require any of these materials. We cannot manufacture in metal or glass. The lasers work by concentrating a small beam onto the surface of the material and burning through. For this reason, laser cut wooden or fabric items will have a dark brown edge, though acrylic will not. The laser is capable of a high degree of precision and detail. The router (which we use for MDF) uses a bit to cut with – this means the router cannot achieve quite the same level of detail and precision as the laser, so is not suited to cutting tiny items. For this reason, the minimum size of MDF we cut is 8cm. Please note that as craft items, all our letters are provided unfinished; wood or MDF will be supplied plain, ready to be painted or varnished by the customer. They may require a little light sanding with fine sandpaper before painting. Acrylic and mirror are usually supplied with a peel-off cover to protect them from burning in the laser and scratching in transit. This will need to be removed once you have received the items. Any traces of burning on the acrylic can be wiped away with a damp cloth. We base all the heights of all the characters within an alphabet on the height of the capital 'M' so all these characters in the picture to the right will be the same size. For example if you want the word 'Hello' you would order based on the height of the 'H' as that is the same as a 'M' . So even if you want everything in lower case it's the height of the capital M that you need to specify. Characters that have a curve at the bottom (O,S,U etc) drop slightly below the line so are slightly bigger than the capital 'M'. 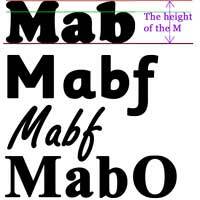 On some fonts lower case 'f' and 'j' that drop below the line will be much bigger than the capital 'M'. Some of the fonts we have had to adjust and will be slightly different from the ones on screen so that they will cut properly. On the invoice some of the letters are followed by "cap" or "low" this is for our use, so we can easliy see the differance between the two. If it is displayed as a capital letter in the invoice we will cut a capital letter. We offer these in a variety of fonts. We have a limit of around 55cm long for chain names and words; if you order a word which is longer than this (more than five letters at about 10cm high for example), we may have to split the word into two parts, but in such a way that it will appear joined when the two parts are placed back together. We manufacture chains exactly how you type them, so please make sure you spell and order them correctly. If you type in capitals, we will cut the word in capitals. ‘HappyBirthday’ would be cut as one piece. We can also do accents and special characters – please enter your requirements into the ‘Item Notes’ section. Laser cut chain names and words are usually supplied with etched lines in between each letter, depending on the font. Due to the restrict ions of the routing technique, it is not possible to manufacture MDF chain names and words with this etched detail. All sizes are quoted in metric with letter heights given in centemetres and material thicknesses in millimetres. If you would like to see the sizes in Imperial measurements, just select the 'Imperial' tab, and the sizes will display in both metric and their nearest imperial equivalent (though we always cut in the metric sizes). The wooden letters can be decoupaged, coloured with felt pens, painted with watercolours, acrylics or emulsions, stained and/or varnished. They may require a light sanding before painting. If they are to be used outside, they will need to be primed with a wood primer and either painted with exterior paint, or varnished with exterior varnish. MDF letters should be primed with a coat of exterior primer before painting. Most letters can be supplied with holes for screwing to a wall or threading onto ribbon or string, please specify your requirements in the ‘Item Notes’ section when ordering. Acrylic and mirror letters are suitable for displaying outdoors. As we manufacture all letters, names and words to order, we are unable to accept any returns. Please check you are ordering the correct size and material before checking out. We are more than happy to advise you at this stage of the ordering process, so do get in touch with any queries before you order.